Arthropods (Greek language for "joint-legged") are a large group of invertebrate animals. Insects, spiders, crabs, shrimp, millipedes, and centipedes are all arthropods. In the scientific classification, all arthropods are members of the phylum Arthropoda. Arthropods have segmented body, an exoskeleton and legs with joints. Most arthropods live on land, but some live in water. Arthropods have by far the greatest number of species of any animal group. Arthropods are a source of food for many animals, including humans. Scientists know of more than 1 million species of arthropods. 80% of all known animal species are arthropods. Many more species have not yet been described. Most arthropod species are insects. "Insects are the most diverse organisms in the history of life". Most arthropods live on land. The phylum Arthropoda is the only phylum of invertebrates that mostly live on land. But crustaceans (crabs, shrimp and their relatives) mostly live in water. Arthropods are also the first phylum to develop genuine flight. Arthropods have a hard exoskeleton. The exoskeleton reduces the loss of water (dessication). This helps them to live on land without drying out. Chelicerates include horseshoe crabs, spiders, mites, and scorpions. 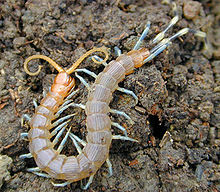 Myriapods include millipedes and centipedes. Crustaceans include lobsters, crabs, barnacles, crayfish and shrimp. Most crustaceans live in water. Hexapods include insects and a few other organisms. Hexapods have six legs. Trilobites are a group of extinct arthropods. Trilobites all lived in oceans. Trilobites disappeared in the Permian–Triassic extinction event, about 252 million years ago. The trilobites are the second most famous type of fossils, after the dinosaurs. Wikimedia Commons has media related to Arthropods. This page was last changed on 31 October 2018, at 01:52.